An ice ball is a large, round piece of ice that melts more slowly than regular ice cubes and prevents watered-down drinks. By using ice balls, you no longer have to worry about your scotch on the rocks, Jack and Coke, or gin and tonic becoming more water than cocktail before you're done with it. There are a few easy ways you can make ice balls at home. Ice melt is one of the reasons why your "homemade" drinks may not taste as fresh as bar drinks. The ice served in bars is designed to fill the glass, utilizing its maximum capacity. This, in turn, keeps everything cooler longer and prevents the ice from melting too soon. The classic cube design that is common in home freezers does not allow for that efficient use of a glass' shape, so your ice melts faster. The ice ball prevents this issue by giving you one large clump that naturally cools itself and slows the melt. Ice balls are perfect when you're drinking straight liquor on the rocks and for lowball mixed drinks like the black Russian and old-fashioned. It's also nice to use ice balls in iced coffee drinks and milk or cream cocktails that you want to keep cold and free of excess water. The average ice ball is right around two inches in diameter (the size of a handball or racquetball). They fit into most highball and lowball glasses. Depending on the shape, the ice ball may not fit into a collins glass. It helps if your glass has a wide rim. Those that taper inward at the rim will not work and your ball may just sit on top. Ice balls are also a great way to keep a party punch ice-cold for a few hours. There are a few ways to make ice balls. Two are very easy and methods that anyone can pull off at home. The other takes some skill but is fun if you're up for a challenge. Carving: Carving ice balls is rather common in Japan. It is seen as a craft and it can take an expert ice ball carver eight minutes to form a ball from a solid brick of ice. It is a skill that takes a lot of patience (and ice) to master, so it's not ideal or practical for most home bartenders. Ice Ball Molds: The easiest and most popular option for the average person is to use an ice ball mold. These are easy to find, especially online. Generally, you have the option between an aluminum press and a plastic mold. Balloons: This easy trick came from Mixologist Bobby "G" Gleason. All you need is a bag of balloons, a place in the freezer to hang them once filled with water, and a night to allow the "teardrop-shaped" ice to freeze. The aluminum or metal molds actually break down a large chunk of ice to form a ball. The force of the mold presses the ice block into the ball-shaped mold and creates a perfectly rounded piece of ice in minutes with little to no effort. Once you get rolling, you can make 30 or more ice balls in an hour, though you do need to have a good stock of ice blocks at the ready. These presses are widely available and come in different shapes as well. The drawback is that they are expensive, selling for $100 or more. Also, the ice balls may not be a full two inches round. The plastic molds are far more economical and often sell for less than $30. The basic design is the same—a two-part mold that you fill with water—and they can make two, four, or six balls at a time. 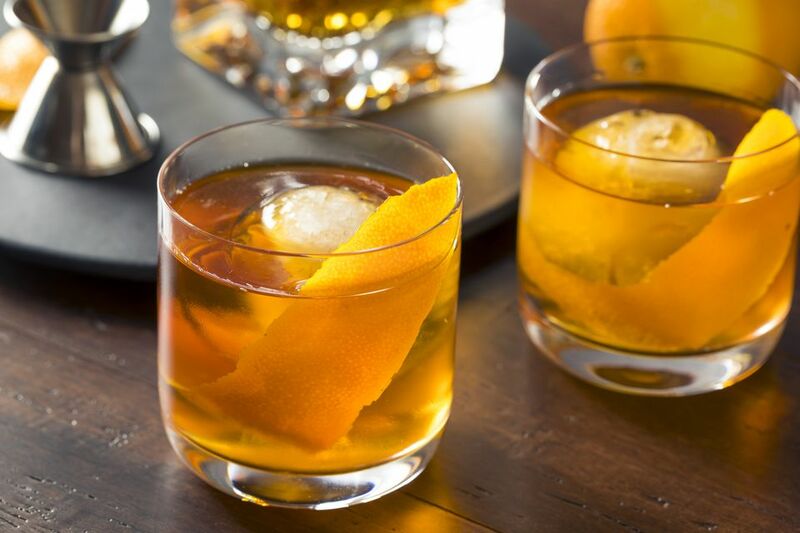 The Whiskey Rounders Ice Ball Maker is a great choice and makes six ice balls at once. The nice feature with this one is that the top molds are separate and a single ice ball can be removed as needed. The more common two-piece molds, such as the Charmed Ice Ball Maker, have a single top piece that is connected to all the ice balls. With this type, you will need to remove all of them at the same time. The main disadvantage to the plastic ice ball molds is the amount of time it takes to freeze each set of balls. Plan on a minimum of five hours—or twice the time needed for a regular ice cube tray—for a full freeze. Placing the mold in the coldest part of your freezer will help speed up the process. If you are going to use them regularly, keep a good stock of ice balls at the ready so you don't run out. You can store finished ice balls in a separate container while freezing another round. Also, if you're hosting a party, you'll have to start days in advance in order to have enough ready. If you're shopping online for an ice ball mold, pay attention to the size of the mold itself. There are numerous ice trays, molds, and presses that are merely a redesign of the standard cube tray. These will essentially make miniature ice balls. While the small ice balls are nice (particularly for those collins glasses) and they're cute for parties, they will melt just as fast as your standard ice cube. The larger ice balls—those that are about two inches and fit in the palm of your hand—are the ones you want to prevent over dilution of your drinks. Separate the two pieces of the mold. Holding the mold over the sink, fill the bottom mold to the top of the rim (not just the sphere shape) with distilled water. Place the top piece over the bottom and push it down. The water displaced from the bottom tray will fill the top part of the sphere. Any excess water will come out of the air holes on the top of each ball mold. Set your ice ball mold on a level surface in the freezer. If the mold is tilted, water will leak out and you will not have a full ball once it is frozen. Allow the mold to sit undisturbed for at least three to five hours, or until completely frozen. The time needed will depend on how cold your freezer is and where you place the tray within it. Once frozen, separate the two parts of the tray. If any of the ice balls stick to the mold, run cold water over the bottom of the mold and the ice should release. The frozen ice balls can be stored in a freezer bag or a bowl in the freezer until needed. If you keep up on the freezing cycle, you can easily have a dozen or more ice balls available at any time. An ice ball's longevity depends on the temperature of the room, the glass, and the liquids poured over the ice. Using a chilled glass and cold ingredients will help increase the ice ball's effectiveness. In general, you might get a couple hours out of a single ball and be able to use it for two or three drinks. If you take a drink outside on a warm summer day, you may get less than an hour out of it. Yet, that's significantly better than the 15 minutes you may get out of your standard kitchen ice cubes. Is Canapé the Best Finger Food for Parties?